If I had to guess (simply based on the pins that fill my Pinterest feed around mid-October) I’d say I’m far from alone in finding the holiday season a potentially difficult time. 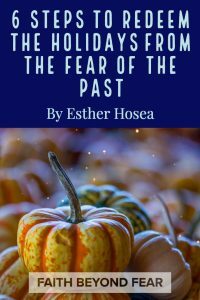 For too many of us, the holidays trigger terrible memories of years past. Personally, they mark the anniversaries of terrible days on which I discovered heart-breaking details about my husband’s sexual addiction and repeated infidelities. For many of us, time that should have overflowed with love, thankfulness, and rejoicing in the work of God is tainted by neglect, abuse, betrayal, and unfulfilled hopes. As the days on the calendar tick through September and into October, our hearts quicken with the anticipation of repeated heartache. What we need is some redemption! So, how are we supposed to move from a place of dread and fear to a place of faith and joy this holiday season? I’m thrilled to tell you, God has spent the last few years teaching me how to do just that. He’s given me great victory, and I’m excited to share some of it with you today. I won’t pretend it will be easy. It won’t. I’m sorry. What I will assert is that it can be done. We can find peace, joy, and even healing this holiday season, no matter our circumstances. Redemption is possible. That is my claim. I wrote a whole series last Thanksgiving detailing how just one actionable step: thankfulness, can change just about everything. You can find that series here. But today, we’re looking at Psalms 37: 3-9 to find 6 steps we can take to allow God to redeem our holiday season. Psalms 37: 3-9 – Trust in the Lord and do good. Then you will live safely in the land and prosper. Take delight in the Lord, and He will give you your heart’s desires. Commit everything you do to the Lord. Trust Him, and He will help you. He will make your innocence radiate like the dawn, and the justice of your cause will shine like the noonday sun. Be still in the presence of the Lord, and wait patiently for Him to act. Don’t worry about evil people who prosper or fret about their wicked schemes. Stop being angry! Turn from your rage! Do not lose your temper – it only leads to harm. For the wicked will be destroyed, but those who trust in the Lord will possess the land. It’s hard to find pleasure in anything when we’re consumed by our pain, but step one is to make a conscious choice to set that aside and delight ourselves in the Lord. Psalms 119:92-93 – If Your instructions hadn’t sustained me with joy, I would have died in misery. I will never forget Your commandments, for by them You give me life. The easiest way to do this is to allow the miracle that is the Word of God to wholly consume us. The Bible is the very breath of God, recorded and preserved for us! Living and active. Through its pages, the God of the universe makes Himself intimately known to us. If that doesn’t bring a thrill to our hearts, I don’t know what will. Because the reality is, no human rejection can outweigh the fact that the Lord God Almighty desires deep, personal relationship with us! Let’s allow that truth to consume us and fill us with delight! Romans 12:1-2 – And so, dear brothers and sisters, I plead with you to give your bodies to God because of all He has done for you. Let them be a living and holy sacrifice – the kind He will find acceptable. This is truly the way to worship Him. Don’t copy the behavior and customs of this world, but let God transform you into a new person by changing the way you think. Then you will learn to know God’s will for you, which is good and pleasing and perfect. To find redemption this holiday season, we have to reject the behaviors and patterns that have failed us time and time again and learn, instead, to be transformed by our God. To commit our actions to Him and allow Him to take control of us. This is the natural next-step to committing our ways to Him. When we finally realize we don’t have to control everything in order to be safe, we can then let go and wait for God to come to our rescue. We can let Him deal with the people and situations that cause us pain, and instead just focus on our delight in, and commitment to Him. Isaiah 30:15 – This is what the Sovereign Lord says: “Only in returning to Me and resting in Me will you be saved. In quietness and confidence is your strength. Can you see how each step follows the last? There is a natural progression. Delight in the Lord leads to committing our ways to Him, which leads to waiting on Him, which leads to a sense of calm that keeps us from worry. When we know the God of the Bible through His Word, we will want to follow Him and we’ll find confidence in His faithfulness. We’ll understand He’s always with us and find there is no need worry or fear. Psalms 16:7-8 – I will bless the Lord who guides me; even at night my heart instructs me. I know the Lord is always with me. I will not be shaken, for He is right beside me. There is a time for anger. It is an acceptable and even appropriate response to sin. Especially sin that hurts us. But the Bible tells us that in our anger we must not sin. The time for anger should be short, lest the enemy find a foothold into our hearts. Prolonged anger opens the door to resentment, which when left to fester will often turn from the person who hurt us toward God. We must vigilantly guard our hearts against such danger and hand our anger over to our Righteous Judge. We can trust whole heartedly that He will handle the situation with justice and mercy. Ephesians 4:26-27 – And “don’t sin by letting anger control you.” Don’t let the sun go down while you are still angry, for anger gives a foothold to the devil. This is what it all boils down to, doesn’t it? The way to find redemption this holiday season is to put our trust in the Lord. To believe wholly in Him. In His love and goodness. He is worthy, because He is always faithful! Psalms 9:10 – Those who know Your Name trust in You, for You, oh Lord, do not abandon those who search for You! I’m here to tell you, as I’ve diligently followed these steps over the past few years, the Lord has changed my whole story! I find myself actually looking forward to the holidays this year because I know the One in whom I have believed, and I am confident that He is able to protect that which I have entrusted to Him until the day of His return. I look forward to praising Him through Thanksgiving and celebrating His work through Christmas! I won’t let anything else define this time for me. He has redeemed it for His glory! At the end of 2016 I discovered that my husband of nearly 17 years and the love of my life had a serious sexual addiction and had been repeatedly unfaithful throughout our marriage. Obviously, that discovery was devastating and nearly ruined me… but God. God showed up (as He always does) in the middle of that dark time and pursued me with reckless abandon. He showed me again and again that no matter what happens, my identity is in Him. Who I am is defined by Him, and He says that I am His dearly loved daughter. 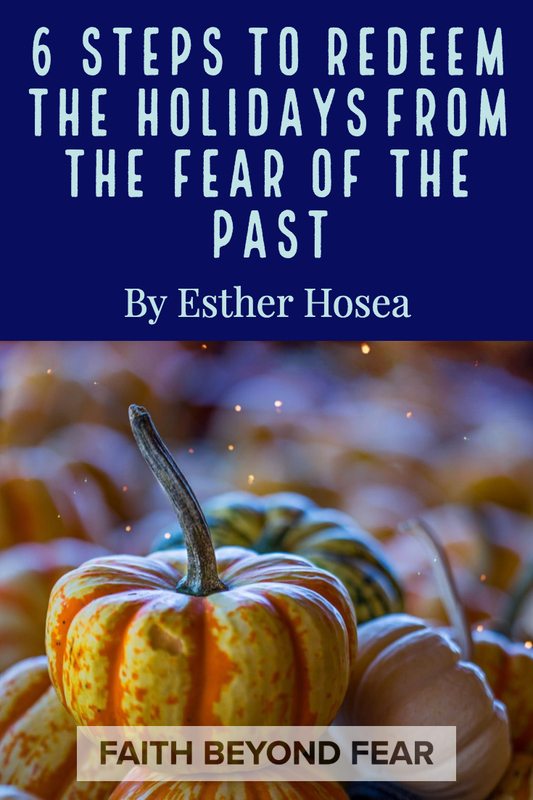 As a step of obedience to Him, I started sharing our story through a blog at hisdearlyloveddaughter.com writing under the name Esther Hosea in order to keep all the focus on Him. After all, this story is really all about Him! Over the past few years, we’ve had front row seats to God’s amazing redemptive power. We’re learning that it doesn’t matter how badly we’re broken, God can make us new! He is remaking me into a whole and healthy daughter. He’s remaking my husband into a man after His own heart. He’s remaking our marriage into a beautiful, grace-filled testimony of His wonderful love! And from all of that He’s building a ministry through us to help others who face the terrors of sexual addiction and betrayal trauma. We are in awe! For me the holidays are hard because of managing expectations. The responsibility has fallen on me to host the events throughout the years since my parents divorce. While I love my family, I don’t love hostessing and negotiating the complexities of emotions involved. As I’ve gotten older, I am learning to speak up and set boundaries but not without some sense of guilt. This year, I did ask for a year off and my extended family handled it very graciously. I still struggle with guilt but knowing my own limitations helps me to not spend another holiday frustrated and resentful. I loved this post. Thank you very much. Thanks for this post. For me, stopping the anger is the tough part. The holidays for me feel like I’ve been robbed. Losing both my parents so young, I am constantly reminded that they are not around to enjoy my kids or me. They’re not here to help me keep the family together or my own crap together. It feels like a colossal unfairness. But God is faithful. Learning to turn over my anger is a continuous lesson. The resentment has died, but the hurt is still there. It isn’t God that hurt me. I have an Enemy for that. The Lord has assuaged my anger, but only in retrospect. in the midst of the holidays, I still feel lonely even surrounded by people. Wow, I’m sorry for your pain Chip! I certainly understand the anger. It used to be a constant battle for me… it has lessened with time to a regular battle. I will never be happy about what happened. (I don’t believe God is happy about it either, so there’s nothing wrong with that.) But I WILL choose to praise the God who redeems our messes and makes beauty where there should be none. What other god can do that? Only our great God! I pray He will continue to give you (and me!) victory in the day to day journey of learning to hand the anger over to Him. It is SO difficult! But His faithfulness never ends – His mercies are new each morning! God bless you my friend!